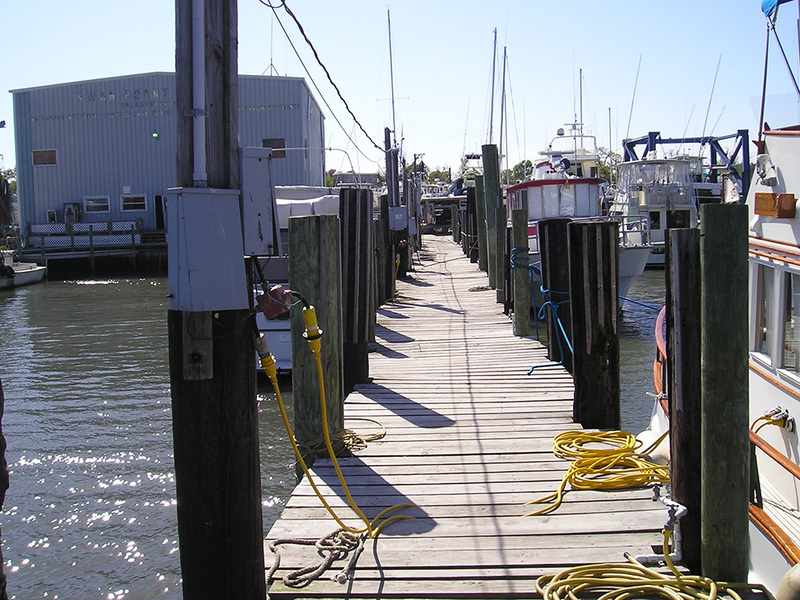 The next stop was Swan Point Marina at Snead's Ferry in North Carolina. The marina has fixed docks, at low tide there is little water, the power doesn't work, the restaurant is closed and the water is shut off. Not exactly according to the description in the Waterway Guide. We have to run the generator to get power. However, the worst story came from a couple stranded here in their new Mainship 40 ft trawler. They hit what is believed to be an illegal concrete and metal fishing net anchor right in the channel 50 yards north of marker #9. It broke the prop, shaft, rudder and transmission. In the last 9 days two other boats hit the same object and are high and dry waiting for repairs at this marina. Fortunately we were lucky and missed it. It seems the fishermen stretch nets across narrow channels at night when they can't be seen. The nets are tied down at anchors. The nets catch every fish that is swimming in the channel. The locals all know who is doing it but no one will tell.